Chicago Police have confirmed details of the racist, homophobic attack, which they are treating as a hate crime. UPDATE (10:20 a.m. EST, Feb. 1): The letter sent to the studio where Empire is filmed prior to the attack contained a white powder, CNN reports. Chicago PD spokesman Anthony Guglielmi said that the powder-filled letter, received at Cinespace Studios Jan. 22, prompted a response from a HAZMAT unit, though its contents were later determined to be aspirin. Though That Grape Juice previously reported that the letter said "You will die Black fag," Guglielmi declined to confirm to CNN what the letter said. Sources close to Smollett spoke to TMZ to clear up what they claim are factual errors in coverage of the attack. According to them, the actor never said that his assailants were wearing MAGA hats, just that they yelled “MAGA country.” They also say that Smollett did not still have the noose around his neck when he got to the hospital. They told TMZ that it was around his neck when police arrived at his building 42 minutes after the attack, however. The sources also said that Smollett didn’t refuse to hand over his phone records to Chicago PD, despite reports to the contrary. He declined to give police his phone, but not his phone records. He’s in the process of gathering those records so that police can confirm he was on the phone with his manager at the time of the attack, as he has claimed. UPDATE (8:30 a.m. EST, Jan. 30): In a subsequent statement, Chicago Police confirmed to CBS News that Smollett did, in fact, say that his attackers yelled "MAGA country" during the assault. They are investigating the attack as a hate crime. "As of 10 p.m. Tuesday, detectives canvassed and reviewed hundreds of hours of video and have now expanded the search area," said Chicago PD Chief Anthony Guglielmi in a statement to USA Today. "We ask anyone with information about this incident to contact Area Central Detectives at 312-747-8382 or report it anonymously to www.cpdtip.com." UPDATE: TMZ originally said Smollett's attackers shouted, "This is MAGA country," as they attacked him, but Chicago Police later said in a statement to the Daily Beast that "there is no report of that being said." Police also told Out over the phone that they currently have no description, including racial identity or gender, of the attackers. 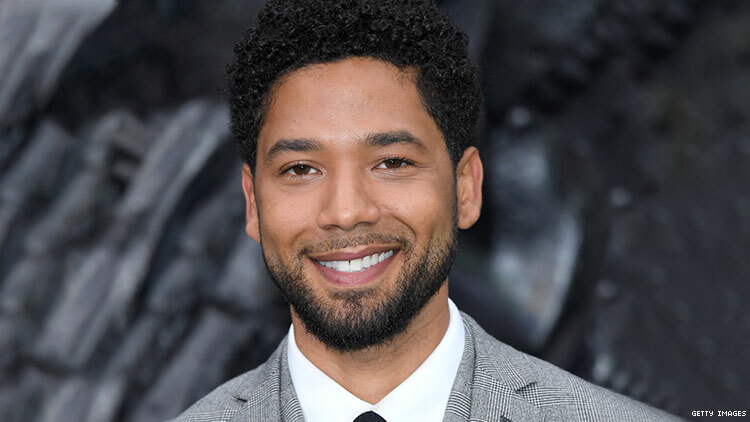 ORIGINAL: Empire star Jussie Smollett is currently in the hospital following an attack where two people assaulted the actor, poured bleach on him, and put his head in a noose, TMZ reports. The attackers reportedly wore ski masks. In initial reports, Smollett says he remembers them saying "This is MAGA country" during the attack, but according to the Daily Beast, Chicago Police later said this has not been confirmed. Smollett fought back, and currently has a fractured rib after the attack. In a statement, the Chicago Police Department confirmed they are treating the case as a “possible hate crime.” The statement says that Smollett is currently in “good condition" while TMZ reports that he was released from the hospital Tuesday morning. Music blog That Grape Juice, the first to post about the attack, also obtained a letter sent to Fox Studios in Chicago addressed to Smollett which said, “You will die Black fag.” TMZ says the letter was sent 8 days ago. The New York City Anti-Violence Project said the attack is "reflective of what we see in our national data on hate violence" in a statement. "Jussie is not alone," the statement reads. "Gay Black men are some of the most vulnerable to violence in the LGBTQ community and this must continue to be addressed."